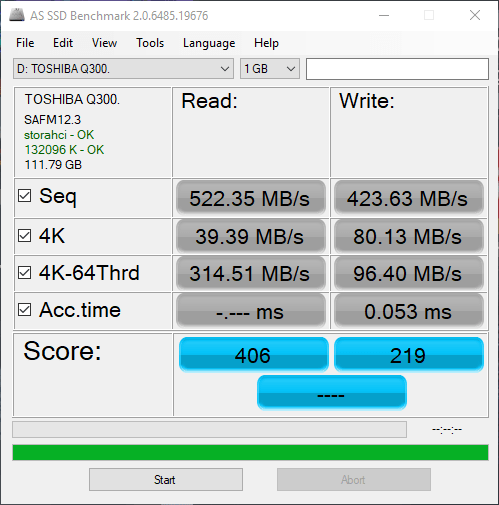 The Q300 is a popular SSD on Amazon, thanks to its high maximum read and write speeds that essentially max out the SATA III connector. Today, we’re going to test this drive to see how it performs in a variety of benchmarks. 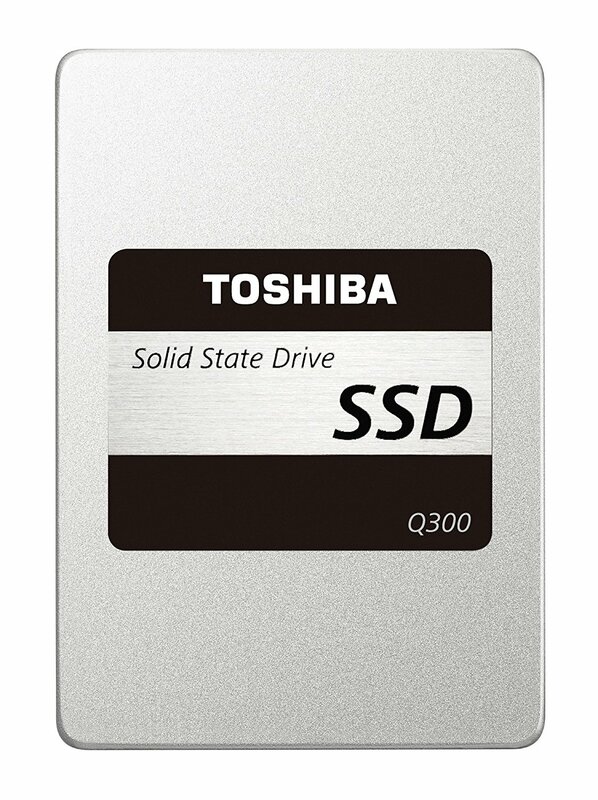 The Toshiba Q300 looks much like other solid state drives, with a shiny metal enclosure and a matching sticker front and centre. Inside, you’ll find a TC58NC1000 controller and 15nm TLC NAND flash. TLC or Triple Level Cell flash offers a lower price-per-gigabyte compared to other designs, like SLC (Single Level Cell) and MLC (Multi Level Cell). That’s done by simply increasing the number of bits stored per cell; SLC is one, MLC is two, and TLC is three. You can see how this works in the diagram (made by Anandtech) below. The Q300 is available in capacities of 120GB, 240GB, 480GB or 960GB. We’ve opted for the entry-level 120GB model to test. Note that we’re testing the most recent (ca. 2016) model, rather than the pre-2016 model which reportedly had some issues handling extremely large (>20GB) file transfers. 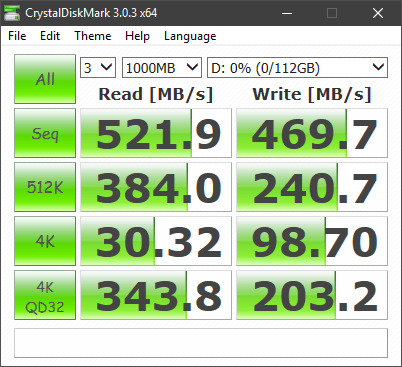 In order to test the speed of the drive, we ran four synthetic benchmarks with varying payloads: CrystalDiskMark, AS SSD, ATTO and HD Tune Pro. Combined, these should give us a good idea of the drive’s performance compared to others at a similar price. The Toshiba A100 we reviewed earlier is the most interesting comparison, but we’ve included other drives we’ve tested in the past as well in case they could be useful. To see our test rig’s specifications, check out our component breakdown here! 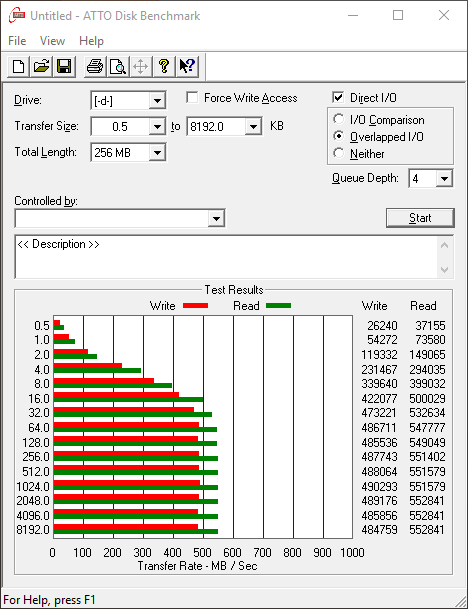 The Q300 shows good performance out of the gate, hitting the highest figures we’ve seen from a SATA-connected drive in sequential read speeds and going near the top of the back in sequential write speeds as well — impressive for a 120GB drive, where write speeds are normally reduced compared to identical drives in higher capacities. 512KB, 4K and 4K queue depth 32 results are also competitive. The Q300 does well here too, with near-identical speeds to what we saw in the CrystalDiskMark test. The access time reading, which isn’t shown in CDM, is also impressive, although the 4K and 4K queue depth 64 results for writing are a little below what we’d hoped for. Again, this is likely a result of the relatively small 120GB capacity, although even the 64GB Drevo X1 Pro did better here. Note that there is a ‘read access times’ bug in AS SSD under the current version of Windows 10; there is always an error message for that portion of the test and no result is rendered. The Q300 reaches full speed quite quickly, just after the 32KB data size mark. The drive doesn’t quite reach its quoted 530 MB/s writes, but it does reach (and even exceed) its 550 MB/s read speed from 128KB blocks onwards. 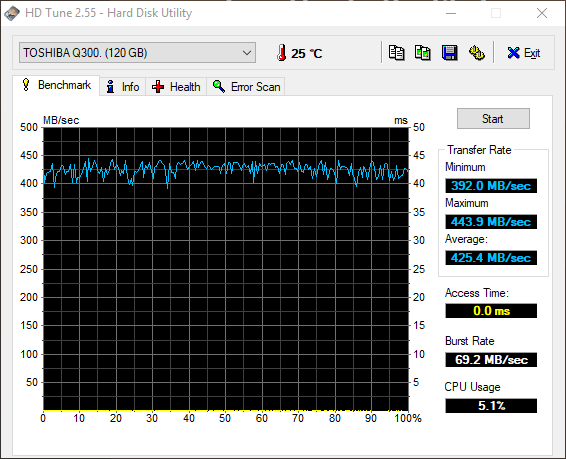 The Q300 shows good consistency here, with a minimum of 392 MB/s and a maximum of 443 MB/s. That’s good for an average of 425 MB/s, the best result we’ve seen in this test (apart from our resident NVMe 1TB drive). The access time of 0.0 is a little interesting, but thankfully we’ve already got a figure for this — 0.053ms — that is more than acceptable. The Q300 lives up to its promises, delivering excellent read performance and strong write performance that come right up to the limit of the SATA III connector. If you’re not able or willing to move to a faster but more expensive PCI-e connected drive, the Q300 is a wise choice despite its slightly elevated price.